For those who can’t live without high-quality car audio, building a stereo system means more than just bringing together car audio parts. It involves thoughtfully selecting each part of the awesome-to-be system and making sure the parts are well installed. An amplifier is one of the elements of a great sounding car audio system. Finding the best amp for the car’s stereo and your listening needs can be quite time-consuming, and tricky (especially if you are building your first custom car stereo). 4 channel amplifiers are very popular among music enthusiasts. These amps have four outputs so they can power four speakers or two speakers and a powerful sub. You can easily hook up a 4-channel amp to your factory or aftermarket audio system. Some come with control features that allow you to tweak the sound just the way you like as you’ll see in the reviews below. Our main objective for creating this review was to provide you with quality information on 4 channel amps. With this information, you are on the right direction to getting the amp you need, and, of course you avoid getting ripped off. Through experience, we have known the value of collecting information from diverse sources. Our review team comprised of highly qualified sound engineers, top-notch car audio equipment installers, judicious reviewers and proud sound enthusiasts with lengthy experience using multichannel amps. To get the best out of thousands of 4-channel amps on the market, we decided to stick to leader brands, and then to high-power models that have excellent efficiency, linearity, and versatility. The review contains amps with largely different specifications but this was intentional: we followed input from real users. As long as you are a fan of quality car audio you will find an amp that matches your listening needs. Let’s get right onto the reviews. The AC1200.4 is among Planet Audio’s revolutionary Anarchy series amps. It is a Class A/B 4-channel operation amplifier that allows you to fine twitch your sound the way you like to achieve the clearest and loudest music. With its MOSFET power supply, this amp never disappoints when it comes to efficient sound magnification. Decreased distortion and improved sound quality: Being a class A/B amplifier, the AC1200.4 is able to produce sound of greater quality compared to that of pure class A amps. This amp has a unique linear circuitry designed to reduce distortion as the power output and sound quality are increased. More power; more volume:This amp is 2 ohm stable meaning that it accepts impedance to as low as 2 ohms. It can power speakers and subs with all channels loaded at 2 ohms. 2 ohm stable amplifiers produce more power, which translates to more volume. Works with any factory or aftermarket head unit: Having both high and low level inputs, this amp is highly flexible. You can use it to build a custom audio system regardless of the type of head unit or speakers your car uses currently. This flexibility is further enhanced by Switchable Input Sensitivity. Very energy efficient: Planet Audio AC1200.4 amplifiers use MOSFETs (Metal Oxide Semiconductor Field-Effect Transistor). This type of transistors is used either to amplify a signal or as a switch. They are superior to other Field-Effect Transistors when used for car audio since they require less current to operate. Verdict: This Planet Audio 4 channel amp is great for you if you are looking for a low-budget amp that gives you excellent control over your music. Check out the AC4000.1D amp on Amazon and buy for a unique listening experience. Here’s another class A/B contender with unique features. The Hifonics ZRX1016.4 gives you decent power (1000 w) and top of the line heat dissipation. It comes with military-grade printed circuit boards that promise great sound for many years to come. Super A/B topology delivers the highest power efficiency and quality of sound. Even when the volume is turned up, the circuitry used by Hifonics ZRX1016.4 results in a smooth, non-distorted high end with less heat buildup. Very high efficiency sound power: The MOSFET output devices technology is designed to produce music at high power efficiency. This enables the amp to run cool and continuously produce distortion-free sound. Gold-plated connections: This Hifonics amp has been tested under harsh marine environments and found to be highly corrosion resistant thanks to the well-coated power, ground, RCA and speaker connections. High grade aluminum heat sink: While the amp produces high power, the heavy duty aluminum heat sink quickly dissipates any heat produced. These are worthy efforts to prevent thermal breakdown or damage to various parts of the audio system. DC, Short Circuit, Thermal and Overload Protection: You have absolutely nothing to worry about concerning thermal or current overload. This amp boasts of reliable DC, thermal, short circuit and overload protection circuits. Whenever the amp heats up, the protection system turns it off momentarily so that it can cool down. Verdict: This amp is dependable and among the most powerful we’ve seen. It’s very linear and can be used as a standalone power source or as a part of a more sophisticated system. Want to know why Hifonics is duped ‘Power from the gods’? Try the ZRX1016.4. Fans of big bass find Crunch Power Drive PD2000.4 incredibly enticing. This amplifier is big; bigger than any other Crunch amp we’ve come across. It literally turns your car into a sound machine with its 2000w MAX power. But even with such high power capabilities it remains cool as it uses QTD (Quick Thermal Dispersion) technology. 4 operation modes: The PD2000.4 allows you to configure your system for best sound reproduction results. Use it in a 4-channel stereo to give each of your four drivers 500 watts at 2 ohms, drive 250 watts to each driver at 4 ohms, or push through 1000 watts to 2 drivers at 4 ohms. Low/no distortion: The amp uses a low voltage circuit which minimizes distortion to ensure that you get the clearest sound even at high volumes. The low voltage RCA inputs also enhance quality sound production. They are made of high quality materials that make strong sound connections. The overall result is a flawless listening experience. High level inputs easily hook up to your OEM audio systems: You need to up the performance of your factory system and are wondering where to get an amp that’s compatible with the system. The Crunch Power Drive PD2000.4 4-channel amplifier comes with versatile inputs for easy connection to any type of stereo. Class A/B topology: Class A/B amplifiers have been proved to be more power efficient and produce sound of higher quality than pure class A amplifiers. Their more dedicated linear circuitry is responsible for the reduced distortion and increased power output and sound quality witnessed in the PD2000.4. Verdict: With more than enough power to crank up your components and low-distortion RCA inputs Crunch Power Drive PD2000.4 is a sure bet to louder and cleaner music from your audio system. If this powerful Crunch Power amp cannot overturn your listening experience, what else will? Rockford Fosgate R400-4D implements its class-D circuitry to offer ultra-efficient sound amplification. It can power your full-range system, but it is also optimized for 4-channel systems so you can power midrange/tweeters in the dash and front doors and run other drivers in the deck and rear doors without a hitch. Play loud and clear music all the time: Rockford Fosgate has paid special interest into the Prime Class D amps. The company has packed more power per square inch than in any other class of amplifiers. You can be sure to enjoy more music power, which means louder and more articulate jams. Many options to improve your car’s audio: Send 75 watts to each of your speakers, use the front channels for the front speakers and bridge rear channels to run a subwoofer with up to 200w RMS. You can even bridge the amp to 2-channel mode to run a pair of subs. The R400-4D serves your needs just the way they are. Full control over everything from the amp’s lower part: Gain control and the crossovers are all placed conveniently and are easy to use. Make use of the controls on the amp to steer the performance of the system to the highest desired level. High durability: The durability features of this amp are a statement of the high-quality of the Prime series. Its 2-position phase allows you to turn the amp from 0 to 180 degrees to match the vehicle’s speaker system. The heavy cast aluminum prevents overheating and damage of the amps interior, ensuring that the amp remains functional for a long time. Verdict: With the kind of 4-channel versatility offered by this amp, you can realize whatever desires you have with the car’s audio system. 75 watts for each speaker is enough to juice up any music. Research more on this ultra-efficient Class-D Rockford Fosgate amp and make your decision. What would you expect from a marine-grade, high-power, waterproof amplifier? Pyle PLMRA430BT amp places itself in a class of its own. Many of the real users in our review team gave this multi-channel bridgeable amplifier high rating for power efficiency, reliability and superior sound performance. Many of its features are captivating, like its Bluetooth connectivity abilities. High power efficiency: This Pyle amplifier uses MOSFET power supplies which are known to use less current. MOSFETs are more complex than other Field-Effect Transistors and are used in highly efficient power supply systems. Thus, you get louder sound with less current – the true meaning of efficiency. Built-in anti-thump delay circuitry: Ever heard a loud thump sound when a power amplifier is turned on? This is due to the sudden heavy current discharge through the speakers, which can damage the speaker. This Pyle amp has built-in circuitry protection to prevent this from happening. Overheating protection: Using high-power amplifiers often comes with the challenge of system overheating. But for the PLMRA430BT overheating is not a problem since the heavy-duty aluminum heat sink offers continuous heat dissipation (drawing out any heat as soon as it is generated). Stream your favorite music from the internet: One of the unique features of this amp is the Bluetooth wireless music streaming ability. Connect it to your iPhone, Android smartphone, iPad, tablet, MP3 player and enjoy easy and fast music streaming. For sure, Pyle Elite Series amps give you an unconventional listening experience. Our thoughts: There’s no other amp that offers you versatile, waterproof performance like the Pyle Elite Series Bluetooth-enabled amps. The PLMRA430BT is a definite pick if you are looking for premium sound amplification. At its highly pocket-friendly amp this quality amp is the most inexpensive way to improve your stereo. The MRV-F300 is a crazy small and lightweight Class-D amp with decent power, hustle-less set up and great sound amplification. When the beautiful glowing blue light comes on, you will be awed by the way it enhances your stereo’s look and performance. Increased power efficiency: Just like other Class D amps, Alpine MRV-F300 uses super-fast switching technology that significantly boosts power efficiency. This means there will be reduced wastage of power and the amount of heat produced will also reduce. Also, the amp doesn’t need a huge power supply internally. High-quality connectors: One of the aspects that really impressed us was the reliability of the amp’s connectors. You can achieve very tight and flawless connections with the connectors. Tight connections translate to faultless set up and sustained high performance. Easy-to-work protective caps at the ends: This amp looks great with the protective end caps on. Beyond the beauty, the caps snap on and off effortlessly. If you intend to plant the amp under a car’s seat, the caps protect wiring from shorting that may be caused by metallic tools and coins previously placed there. Solid, easy-to-use controls and switches: Have you seen those amps with flimsy controls that change when there’s vibration? Alpine MRVF300 provides you with crossover functions that are tight and steady. They only move when you want to change the bass or other output to match your listening requirements. Final Thoughts: If you are building a custom system the first time and you want a small amp that’s east to install and use, then Alpine MRV-F300 is a great option. Don’t hesitate to pick the MRV-F300 – it will not disappoint. Kenwood provides you with the most reliable way to get around the challenges of limited space and harsh environments for audio equipment. The 22154656 is a compact surface mount amp that’s simple to install (comes with easy hook ups). With a 600w peak power output, the amp can satisfy a wide range of car stereos with three or four speakers. Enough power for your car, boat, or motorcycle audio system: The 22154656 model works amazingly well in 4-channel modes. And with a peak power of 600 watts (can peak at 700 + watts sometimes), you can set it up in your automobile for a better and more enjoyable listening experience. Fully protected against shorts, moisture and corrosion: In addition to the amp being fully circuit protected, its printed circuit board (PCB) is sufficiently coated to enable it shed moisture quickly and resist corrosion. Small size to fit cars with little space for audio equipment: If you have very little space left to install additional audio equipment, the Kenwood 22154656 amplifier is an excellent choice. It is very lightweight and compact; among the smallest high-quality amps in this review. Built-in signal sensing turn-on: This provides superior amplifier control. When this feature is active, it senses an audio signal on RCA inputs to individual channels, unmutes that channel and enables the power. We were pleased with the way this small amplifier takes control of the system to give you better sound all the time. Solid, highly durable hardware: The Kenwood 22154656 amp is built for long-term usage. From the printed circuitry and the connectors to the chassis, everything is designed with high quality material. This is more or less characteristic of Kenwood amps, and a clear explanation as to why Kenwood is a hot choice among people who use car amps extensively. Our view: The 22154656 may be less powerful than other 4-channel amps in this list but considering its size it is a mind blower. Take your stereo to the next level of performance with this small Kenwood amp. Check price on Amazon. Enjoy the amazing amplification value of Rockford Fosgate in the R300X4 Prime amp. You’ve got everything well set up: speakers on the doors, tweeters strategically positioned, and subs in the back but your music is still subpar. Rock your tunes with this highly versatile R300X4 Prime amp. That’s what is missing. Speaker-level inputs: There’s a good reason for the R300X4’s reputation of incredible versatility. These inputs allow you to hook up the amp with just about any audio system including a factory stereo. You can then use the high- and low-pass filters and bass boost to push the amp to its maximum performance. Heavy cast-aluminum chassis for superior heat dissipation: You’ve probably used amplifiers that heat up during operation and you didn’t like the experience. There are no worries about heat damaging this amp’s interior. The chassis continuously draws out heat to ensure sustained, reliable play. Built-in current and temperature sensors: Speaker impedances keep changing when the music is playing. The R300X4’s in-built sensors keep track of the power supply temperature and output current, ensuring that any short circuit or plunging speaker impedances don’t hurt your system. Our view: Grab this amplifier for an all-in-one setup. It’s very easy to set up and it packs in loads of power into your audio system for a better listening experience. The Rockford R300X4 Prime works perfectly with any stereo system and it will definitely upgrade yours. The BOSS Audio R1004 400w MAX 4-channel class A/B amp is very linear and able to produce sound with minimal distortion. Though not as efficient as the class D competitors, the amp doesn’t disappoint when it comes to power output. And with its built-in thermal protection you can be sure to enjoy cool sound without worrying about amplifier overheating. Enough power for even the most demanding door, dash, or deck speaker: With 400w peak power, the R1004 is among the best amps to use when you want to move door and dash speaker amplification from the head unit to a highly dedicated amplifier. Thermal and short protection: What a joy to know your amp is monitoring itself constantly for its safety. Boss Audio R1004 has a built-in thermal protection circuit that turns the amp on and off to avoid system overheating and damage. In case there’s an electrical short, the protection circuit automatically cuts power output until the short is resolved. R1004 connects to any standard source unit: Why do you need an amp that can work with your existing source unit? If you want to use your source unit’s volume controls, your desired amp should be within range to match the source unit’s output. The R1004 features Switchable Input Sensitivity, a feature that gives you the freedom of connecting the amp with any standard source unit. Build your audio system the way you want, now and later: Boss Audio R1004 has both high-level and low-level inputs. These make the amp quite flexible; as in you can build a customized audio system from just about any standard OEM or aftermarket source unit. Verdict: With Boss Audio A1004 amplifier, there’s merely nothing to stop you from enjoying high-quality music while behind the wheel, regardless of the type of audio system your car uses. View this moderately priced amplifier on Amazon and prepare for next-level in-car entertainment. Add JL Audio RD400/4D to your stereo to improve the sound and feel of your music. This 4-channel amp can power each of your speakers with 75 watts for great high to mid frequencies. And for the bass, you can switch the amp to 2-channel mode to run your two subs with up to 200w RMS each. Low current demand and low distortion: This amp ensures that you enjoy your music over the refreshing whistle of the wind while enjoying your road trip. It delivers sound with absolute fidelity without straining the car’s electrical system all thanks to the brand’s NexD amplifier technology. Incorporate the amp into a factory system quickly and easily: The amp features speaker-level inputs with two auto turn-on modes. These enable you to hook up the amp to your factory system without the need for a remote turn-on head or RCA connections for the setup. Charming LED light and removable cover: You’ll fall in love with this amp once you set your eyes on it. The blue accent lighting added by the LED clip lights charm the amp’s looks as well as your entire car stereo. The removable cover then hides the amp’s controls for a handsome, tamper-resistant appearance. Highly efficient filter configuration: The JX400/4D offers quite a unique frequency response. The frequency response range is 20 Hz to 20 kHz but the filters are designed with more flexibility than in most amplifiers. You get a 12dB/octave filter that’s configured to function as either a high- or low-pass filter. Verdict: Although highly priced, the RD400/4D is an attractive option for those who know the true value of quality sound amplification. Just look at the amps engineering and know what to expect. Check out the current price of RD400/4D on Amazon today. The GM-D1004 amp is among Pioneer’s masterpieces that have shaken the growing micro amplifier niche. This amp delivers sound output and quality that proudly defies its small size. Loaded with features that simplify amplifier integration into aftermarket and factory systems, this amp is something a serious car audio lover should explore. Multiply your factory system’s power output: The GM-D1004 sends 45w RMS to each of your speakers. Being exceptionally efficient, the amp can share power with your head unit and this would save you a great deal of wiring hassles. This amp will completely transform any car’s stereo output. Small sized amp that can be installed almost anywhere in many cars: Many users loved this amp for its small, compact body. It can even fit behind the dash in a large number of vehicles. Pioneer’s best compact amplifier: The GM-D1004 proudly wears its hat as a micro-amp. You can rarely lack a place to mount this amp and start enjoying improved sound performance from your stereo. It could be in the glove box, behind the receiver, or in the center console. There are many places to hide this micro amplifier. Easy install and flexible application: Pioneer GM-D1004 is not only small and powerful but also super easy to install. Installation involves only connecting the power and ground terminals at the radio. Using the hi-level and low-level inputs with signal sensing remote turn on, you can combine both to run with a factory or aftermarket source unit. Verdict: Once again, if you are here looking for a powerful micro amplifier, the Pioneer GM – D1004 is a great pick. Don’t be fooled by its size, this amplifier can work with even the most demanding drivers. View this budget Pioneer 4-channel amp on Amazon. Not many people would really understand the value of an amplifier that is the size of their palm. We didn’t either until the Clarion XC2410 4-channel amp was put on the review table. Delivering 50 watts RMS per channel, this micro-sized amp can fit almost everywhere. See more about it below. Stands up well to challenging environments: This dollar bill-sized amp can power speakers in boats, ATVs and other challenging applications. “But I only want an amp for my car”, that’s right; but this amp is more versatile than that. You’ll like the nickel-plated connectors that are resistant to corrosion and support electrical flow in all conditions. Enjoy super-clean signals: Car stereos without a high-quality amp produce unpleasant electronic noise. The XC2410’s circuit is designed with uncompromising resistance to magnetic noise. Add to this high-quality terminals that offer low electrical and contact resistance and you have super-clean, distortion-free sound. Your system is safe from overcharge thumps: Clarion XC2410’s soft turn-on and turn-off circuitry protects your speakers from damage when turning the amp on and off. This feature is particularly impressing, coming from such a ultra-small amp. You cannot regret hooking up your stereo with this intelligent sound amplification tool. MOS-FET amplification: How else would this small amp amplify sound so efficiently?The MOSFET power supply is the major reason behind the XC2410 ability to deliver unyielding linearity and power output. The circuit is more efficient and delivers more power with less distortion. Our final thoughts: Clarion fits in very small spaces and is therefore a great option if you are looking for a micro amp with quality audio power. It is engineered well to deliver lots of good, clean sound. Check the XC amp on Amazon and see for yourself why it’s among the best amps in 2019. Do you find pleasure in building great sounding car audio systems? We do. The most enjoyable part of the task is matching good quality speakers with an amazing amplifier for a more powerful, clearer and articulate sound. You want to do this too. But it’s critical that you first find an amplifier that will fulfill your requirements. Amplifiers are all about magnifying sound. It’s obvious that more wattage means more amplification and thus more sound. For the majority of applications, 50 to 75 Watts RMS will produce sufficient volume. An amp with this power rating can also be bridged (if it’s bridgeable) to drive your sub well for greater sounding bass. Generally, a higher power rating means more sound volume. But you also have to remember that any amp with over 1000 Watts RMS will normally require that you add an extra battery or replace the existing battery with a more powerful one. Though resistance is quite a technical aspect, it may not be as confusing as you think when considering 4-channel amplifiers. Let’s first give you a hint. Building a great sound system is all about creating synergy. In this case, synergy is created by matching your speakers with the right amplifier. Check your speaker’s power handling and the amplifier’s different output ratings. Here’s the hint now: It’s great to connect high impedance speakers to an amp BUT you don’t want to hook up low impedance speakers, say 4 ohms, with an amplifier that specifies a minimum impedance of 8 ohms. Size is a factor everyone must consider regardless of the type of amplifier in consideration. It’s pretty simple – you need an amp that will fit into the available space. If you have big SUV, size may not be much of a limiting factor. But if you have a small, pretty Roadster offering without much space for installation of extra audio equipment, you need an amp that can fit in tight spaces. We have reviewed several compact or micro amps above so you will find the best-sized amp for your car. 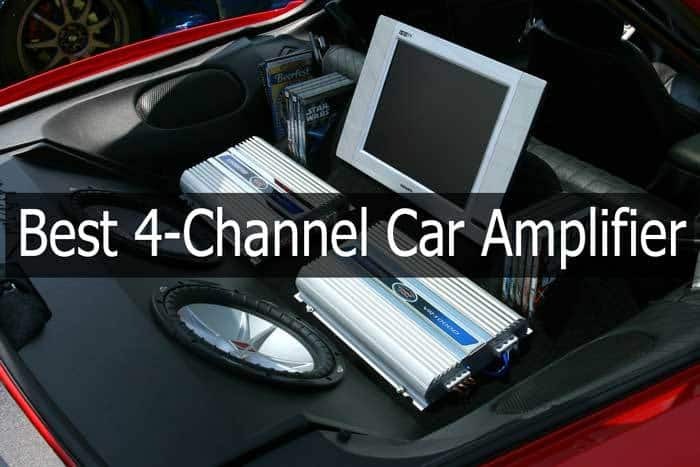 The above three aspects provide a general direction toward the best 4 channel car amp for your needs. Here are a number of features that make an amplifier more desirable. When find an amp with these features, go after it. Quality build: the best amplifier has great engineering and is well-designed for excellent sound amplification. Original designs from well-known brands feature the best designs. That’s why our review has focused on winning brands only to ensure that you don’t get an “okay” amp but the best. Built-in high- and low-pass crossovers: These make is possible and easier to tailor your sound system to your liking. If the crossovers are adjustable, the better the amp is (though adjustability is not a key concern). Good terminals: Ideally, a great amplifier should have high-quality terminals that are easy to connect power and speaker. The terminals should remain well-connected and secure in all applications. Class A/B or Class D amplifiers: Which is better? We’ll give you the facts to help you decide. We hope you are now better informed on how to choose the best amplifier and will be soon building a great system for a more enjoyable listening experience. Planet Audio AC1200.4 ticked all the boxes to become our best 4-channel car amplifier. This amp will make your stereo thunder with its 900w RMS. It is well-built to last and utilizes the MOSFET technology to operate efficiently and with little heat production. It also comes with a variable equalizer that allows you to tweak your sound to your most pleasurable level. The AC1200.4 also blends in well with both OEM and aftermarket systems, so in case you want to upgrade your system easily and in a less expensive way, this amp makes it happen. The amplifier is favorably priced; there are other 4-channel amps with even more than twice its price but they can match its performance and quality. So, in our view Planet Audio AC1200.4 is the best for cleaner, louder, and punchier music.